The Chicago Bears (2-3) and the Atlanta Falcons (2-3) will go head to head later this afternoon. Both teams have their fair share of both strengths and weaknesses. The Falcons are led by the seasoned Matt Ryan. He’s been having one of the best seasons of his already impressive career. He’s also noted as being one of the best QB’s in the NFL currently and it isn’t hard to see why. He’s typically extremely efficient which is what sets him apart from the Bear’s QB, Jay Cutler. Now Cutler is no slacker, he’s tied for second in touchdown passes and tied for third in completitions. This is a big deal and Cutler is a great quarterback and he deserves a lot of credit. On the other side of things, he also has turned the ball over eight times in five games which is where his statistics turn negative. Looking at the quarterback position only, I’d go with Matt Ryan over Cutler because Ryan is more reliable in getting the football into the end zone and not turning it over. Even though Atlanta has the ideal QB, Chicago has the ideal running back. Matt Forte is one of the top in the NFL currently. Even though he had an out of character fumble last week against the Carolina Panthers, Forte still managed to pick up 150 or more yards from scrimmage for the third time this season. The Falcons defense are not as feared as the Bears. In fact, the first five games have shown that they give up running yards to pretty much all of the teams they have faced this season. The Bears have a deep and effective defense that will find ways to stop the Falcons. It might hurt the Bears that they have given up so many yards to wide receivers. This’ll leave the Falcons to rely on their passing game which is bad news for Chicago. The Falcons have a dominate WR in Julio Jones. Jones is absolutely on fire this season. He’s managed to rack up 40 catches for 552 yards and three touchdowns during his first five games. He isn’t as dominant in the red zone so the Bears may find ways to stop Jones from absolutely dominating Chicago. The other wide receivers for ATL also have significant roles and Ryan frequently turns to them as well. These guys are Roddy White, Devin Hester, and Harry Douglas. Douglas has actually been inactive for the past two weeks but he’s a steady asset to the team when he’s 100% healthy. The Bears are also plagued by injuries when it comes to the WR role. 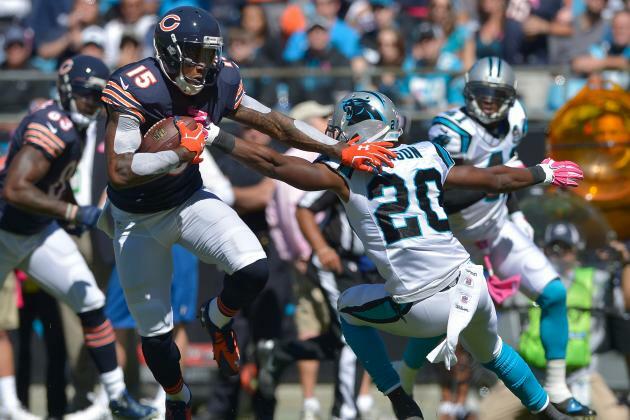 Brandon Marshall is a seasoned and trusted WR but he hasn’t been as effective in the role due to an ankle injury. Alshon Jeffery leads the pack for the Bears wide receivers with 26 catches for 359 yards but that’s about it for the Bears. ATL has a much deeper list of wide receivers than the Bears do. This could be vital if the game comes down to the wire. Since they only have one reliable WR, Chicago turns to its tight end and they are not disappointed. Martellus Bennett is having one heck of a season with 32 receptions for 312 yards and three touchdowns. The Falcons aren’t able to compete with a tight end who’s on the same level as Bennett is. The Bears offensive line has had some serious injuries so far this season. Cutler has been sacked 12 times this season. 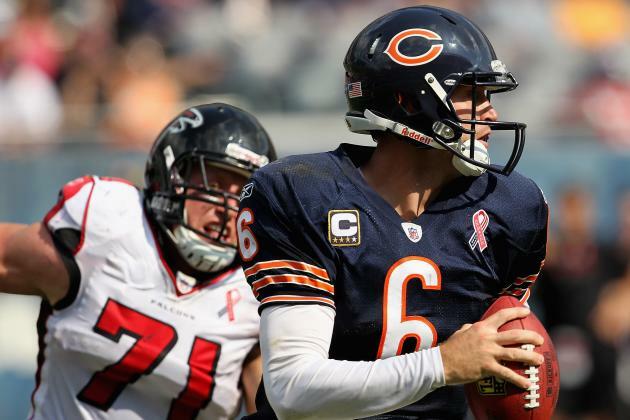 The Bears need to step up and protect their quarterback if they want to have a fair chance against the Falcons. Atlanta doesn’t exactly have a dominate offensive line either. Matt Ryan has been sacked six times in 197 passing attempts. This game is going to come down to which team is the most seasoned and having a veteran leader will likely help. It comes down to which quarterback handles the pressure better. Both have things on both offense and defense that they could improve on, but this will not be a bad game. It will hopefully be extremely competitive and interesting to watch.